My wife and I went on a winter getaway vacation a few years back and we had the opportunity to see some beautifully sculpted ice carvings. There were various different sculptures representing different aspects of life from the daily trip to the office, to a fun-filled visit to the ballpark. While all of these sculptures represented different aspects of life they also had something else in common – they were all created by a master sculptor whose main tool was a chainsaw. I don’t expect to ever have the skill to do what he did with a chainsaw, but that doesn’t mean I don’t appreciate innovation. He probably didn’t use the BLACK+DECKER LPP120 20V Lithium Ion Pole Saw, but it’s a great tool for cutting and carving nonetheless. This innovative power tool can potentially make the process of cutting old tree limbs a lot easier. It’s one of the most popular chainsaws on the market and it retails for a lot less than some of its major competitors. What makes this chainsaw so unique is that you attach it to the end of a pole so that you can reach higher up branches without the use of a ladder. The pole’s about 10 feet, but with a chainsaw on the end, it gives you an extra reach of up to 14 feet. In most circumstances that’s more than enough to handle any job you may have. One of the other obvious advantages of this lithium-ion powered pole saw is that it doesn’t require gasoline to operate. You simply charge it as you would any other battery-powered device, which means you don’t have to worry about running to the gas station to get more fuel. It also means you can feel comfortable knowing that you’re not doing any harm to the environment while you use your saw either. You get the convenience of a gas-powered chainsaw without the noisy and damaging internal combustion engine. If you’re concerned that a battery powered chainsaw won’t have the power to get you through the job, you’ll be pleased to know that the BLACK & DECKER LPP120 is capable of performing more than 100 cuts on one charge. We have a couple of trees in our backyard and when we get out the chainsaw to do some trimming I would guess that we do no more than 30 or 40 cuts at a time, which would mean that this saw would be more than capable. This saw doesn’t have the largest blade bar, but at 8 inches it’s more than capable of cutting through most small to medium branches. Typically it’s designed to cut branches that are no more than 6 inches in diameter. If you have a tree with larger branches than that, you’ll need something that’s a little more heavy-duty. This makes a great trimming tool for the average home user. I wouldn’t recommend using it as your main chainsaw if you own a tree cutting business, though. The warranty on this Black & Decker saw is a standard two years, which is what I would consider the very minimal acceptable for an outdoor power tool. There are saws with worse warranties that only cover you for about a year, and for obvious reasons that’s simply not acceptable. Two years isn’t fantastic, but it does cover you long enough to work out any kinks you may have with your machine before it expires. When I came across this saw one of the first things that popped into my mind was how difficult would it be to cut with a saw on the end of pole. Most chainsaws are fairly heavy and the idea of having to wield one from the end of a pole simply didn’t sound like a good idea. As it turns out this one only weighs in at about 6.3 pounds, which makes it one of the lightest ones around. You’ll still likely feel a little bit of an ache in your shoulders after an extended cutting session, but it shouldn’t be too much to manage. The extra reach that the pole provides the user isn’t the only advantage of its design. It’s also adjustable so that you can set it at a length that’s comfortable for you. After all, as human beings we come in all different shapes and sizes and it’s nice to know Black & Decker has recognized this. With the ability to set the pole at a length that fits your body type it makes the saw a lot more maneuverable and easier to use. When you’re handling a chainsaw with its sharp blade, safety is of obvious concern; that’s why this one also includes a blade guard for safe handling. You still have to be conscious of the potential for injury, but with this feature the chances of injury are reduced significantly. Critics expressed concerns with the ability of this chainsaw’s battery to hold a charge. In many cases it’s been suggested that it won’t come anywhere near to making 100 cuts on one charge. The other thing that seems to be a reoccurring problem with this chainsaw is that the chain can come loose and fall off. Both of these issues are hard to overlook, but they don’t seem to represent the experience of most people that have bought one of these saws. When you’re purchasing a chainsaw that is relatively inexpensive you’re not likely to get one with the same cutting power of some of the best saws on the market. 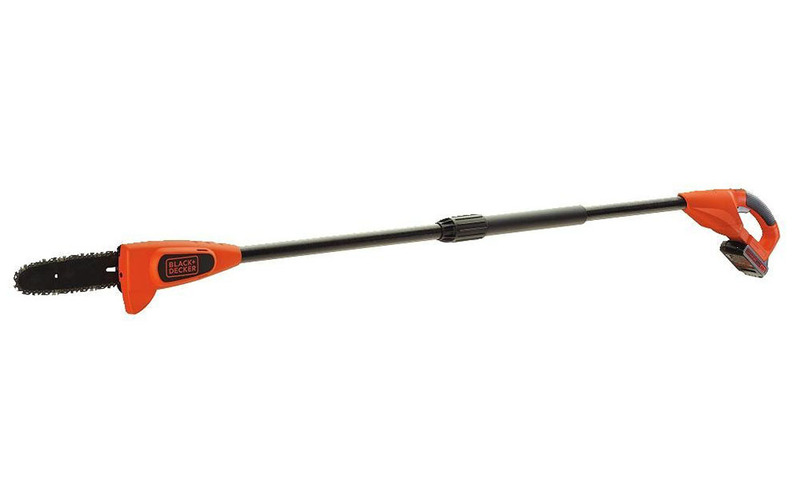 Having said that, the BLACK+DECKER LPP120 20V Lithium Ion Pole Saw is a decent alternative if you’re on a tight budget. The pole saw design makes it easy to reach higher-up branches without using a ladder and it’s nice and light so it won’t wear your shoulders out. It’s far from perfect, but it will get the job done.